I had to practice a few times before I learned how to cook kale. Sometimes you don't even need to cook kale, especially when it is mixed with salads and eaten raw. Otherwise, it is either steamed, boiled or sauteed. To boil kale, rinse a bunch of kale thoroughly with cold water and then remove the spine by cutting off the thick inner stem. Boil a big pot of water, adding about 1/2 teaspoon of salt. While the water is boiling, place kale in the water and stir. Then cover the pot in a way that leaves a little room for steam to escape. 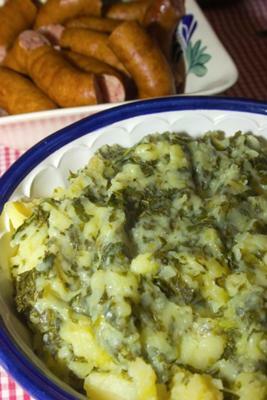 Quickly cooking kale in this manner means you won't lose any of its structure or color. After four minutes, stir the kale and then recover, cooking for another three minutes before testing a piece of kale for doneness. If it is a little chewy but not tough, then it is done. Strain and rinse kale immediately with cold water in order to prevent it from becoming too soft. Putting salt in kale water not only enhances taste but also shortens the time it takes to cook kale. Without salt, the toughness of the plant apparently increases cooking time as much as 10 to 15 minutes. In addition, salt keeps the water from becoming too acid, which prevents kale from turning a washed-out, somewhat unappetizing green color.I forgot to add salt one time and it does indeed turn kale a grayish-green color that doesn't make people want to eat it. Saute kale in a pan with some crushed garlic and one tablespoon of olive oil over medium heat and add it to salads or meat dishes. 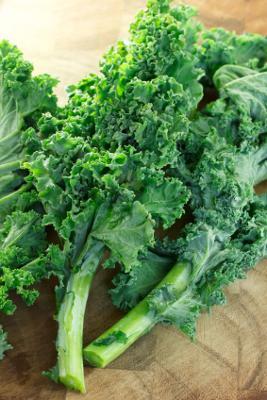 When learning how to cook kale recipes, I noticed that many recipes often incorporate lemon juice or balsamic vinegar. After doing a little research, I discovered that this is to heighten the flavor of kale and to also draw out the rich amounts of vitamins and minerals in the vegetable. So don't forget to add one of these two ingredients when making kale recipes.